Barack Obama, Hillary Clinton, Joe Biden and scores of other Democrats voted for the construction of at least a double-layered wall on the southern border with Mexico in 2006, but the wall was never built after their party derailed it the following year. Two-thirds of the Republican-led House, including 64 Democrats, approved the construction of the wall. Eighty of 100 senators approved the bill in the Senate. Then Sens. Obama, Biden and Clinton were among the 26 Democrats who approved the bill, as well as Sen. Chuck Schumer, who is set to take over leadership of the Senate for Democrats in 2016. 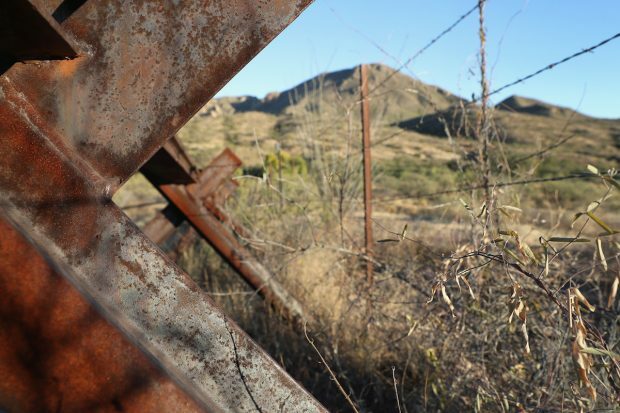 Nearly a decade later, DHS has built only 35.6 miles — about 5 percent — of the fencing. That’s because the following year, a new Democrat-controlled Congress quietly gutted the wall by sneaking an amendment to the law into a massive 2008 spending bill. Republican Sen. Kay Bailey Hutchison offered the amendment, which removed the requirement the wall be made of double-layer fencing and instead let DHS construct whatever kind of barrier officials deemed appropriate. DHS has constructed single-layer pedestrian fencing or placed vehicle barriers that don’t keep pedestrians out along the vast majority of the 700-mile stretch, opting to construct the double-layer fence on just a small fraction of the border. Democrats now boast the fulfillments of the law have been met, although it’s obviously far short of what the Congress directed in 2006. Obama has mocked Republicans dissatisfied with the result, declaring the wall “basically complete” in 2011 and asserting Democrats did everything Republicans asked for. President-elect Donald Trump made the construction of a “real” wall along the entire 2,000-mile stretch of the southern border with Mexico a central part of his campaign. He has said the “beautiful” wall will be from 35 to 50 feet high and made of pre-cast concrete.